When it comes to summer holidays with kids, the biggest challenge can be keeping everyone entertained. While older kids might be content to lounge by a pool, younger ones have plenty of energy to burn and keeping them busy can be a full time job. The beauty of an alpine holiday is the choice of activities for all ages and levels of intrepidity. If you’d like your children to get outdoors and try something new in a healthy, active environment, then a summer trip to the mountains is the answer. But it doesn’t get hot in the Alps.. does it? It certainly does get hot in the Alps during the summer months! Throughout June 2017, Samoëns has experienced consistently hot and dry temperatures of up to 38°C. Typically, the months of July and August are reliably hot and sunny, with regular thunderstorms that build up and create a fantastic sense of atmosphere. June is generally very warm too, albeit less reliably. Thanks to the cooler evenings, the Alps have long been considered an ideal place to retreat from the summer heat and to benefit from a restorative dose of fresh air. While daytime temperatures can be scorching hot, evenings bring a welcome coolness (so you’re guaranteed to sleep well even in the peak of summer). When its scorching in the cities, the Alps offer air movement and welcome respite of an evening. Trying a new activity together can be an ideal way to bond as a family. When parents and children are all total novices, tackling a new challenge together can be a fantastic way to share an experience and to create new family memories. When everyone is pushing themselves outside of their comfort zones an entirely fresh new dynamic is created. Forget the beach; why not try white water rafting, rock climbing, canyoning, Via Ferrata, parapenting, or glacier walking together? An alpine adventure holiday just might help your family to strengthen relationships, discover strengths, develop communication and have a great laugh together. What does a summer holiday in the Alps involve? Hiking – explore marked mountain trails with mountain refuges offering fabulously authentic lunches and overnight accommodation. 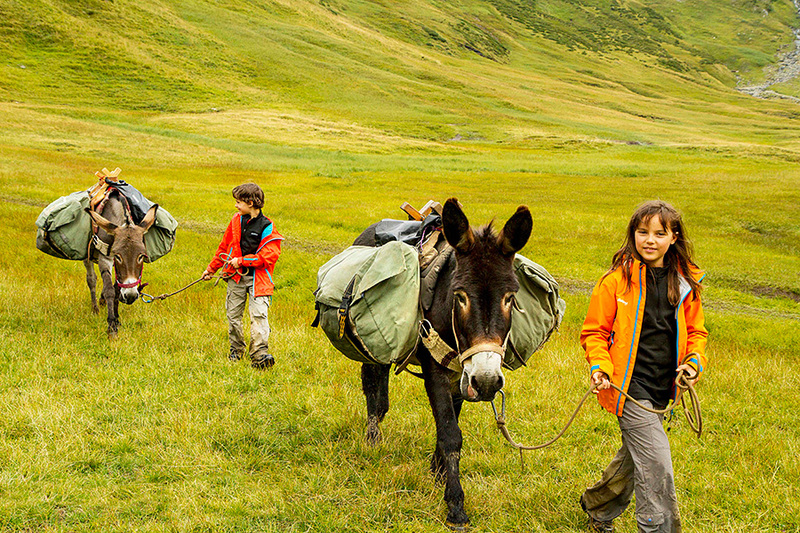 You can even hire a pack donkey to help carry equipment and young children on your hike! Parapenting – with an experienced pilot you’ll make a tandem flight high over Samoëns in total safety. No jumping from cliffs is involved, you simply jog down a grassy alpine pasture until your feet are no longer touching the ground! Canyoning – with a guide you’ll put on a wetsuit and make your way down a stunning natural canyon by walking, climbing, sliding, abseiling, jumping and swimming. Fabulous fun for the whole family, from 8 years of age. Via Ferrata – a combination of rock climbing and hiking, Via Ferrata is a route of iron cables and ladders allowing inexperienced climbers to access a challenging route over impressive vertical terrain in total safety, attached securely to the rock face at all times. Rock climbing – under the guidance of an experienced instructor you’ll develop rock climbing techniques on a natural rock face. Caving – with a specialised caving guide, you’ll go underground to explore caverns and tunnels that you’d otherwise have no idea existed nearby Samoens. White water rafting – slip on a wetsuit, life vest and helmet for the ideal family experience, riding the rapids of the Giffre river here in Samoens ! Canoraft and Kayaking – tackle the Giffre river rapids in a solo or dual-place kayak. A bit of muscle power is required, this one’s ideal for sporty folk looking for a challenge! Horse riding – saddle up for a one or two hour trek exploring the waterfalls of Sixt Fer-à-Cheval on horseback. o Pony rides – for young children from 3 years of age, parents can hire a pony to lead for 15 or 30 minutes of fun in Sixt Fer-à-Cheval. Kids love it! In and around Samoëns you’ll also find paintball, high ropes, a zip line, mini golf, archery and much more. Booking your own chalet or apartment, with or without a private pool. Cycling or walking to the bakery of a morning to pick up fresh croissants and crusty bread for breakfast. An utterly relaxed pace of life; no traffic, no queues, just cruisy French village life. Exploring the delights of a French supermarket and stocking up to cook family meals at your own pace. Rosé filled evenings in the town centre, with live music and a range of restaurants to choose from. If you’ve got questions about booking and organising your next summer getaway in Samoëns, the team at ZigZag are full of useful info and are more than happy to help. Louise is in charge of the ZigZag office and is a native English speaker. She is available any time on +33631204410 or by email to info@zigzagski.com. You can also pop past the ZigZag office at 126 Grande Rue (in the centre of Samoëns’ pedestrian street) to chat in person. I like how you mentioned trying a new activity together can be an ideal way to bond as a family. As a family stretches themselves outside of their comfort zone they also grow. I am planning on taking my family on a trip this summer because I have been away a lot for business. I’ll have to consider the alps when planning my next vacation.